As demos go, Sucker Punch's PS3-exclusive inFAMOUS feels a little short, but awfully promising. It propels you — an electricity-spitting semi-clueless super-dude — off a rooftop and through an urban debris field toward a dusk-lit public square, up a tower of sorts, then down again to do battle with a gang of gun-toting, masked bad guys in red hoodies. Along the way you'll charge batteries, watch cartoons, demolish mannequins, leap from tall buildings, spray electricity like a busted transformer, lob vehicles like Hot Wheels racers, and listen to your redneck pal Zeke describe pizza with the intensity of someone eyeballing everything but the staples at the center of an adult magazine. Grand Theft Superhero? Maybe. It's hard to tell, scanning the map, since you're only allowed to explore a slice of it here, but I'd estimate you'll eventually have free run of roughly half Liberty City's breadth. Also, while you can ostensibly go anywhere in the full game, its fictional three-island "open" city setting still has the usual lids screwed on tight. You can scale buildings, but you can't punch through flimsy paneling or storefront glass and crawl around the rooms inside. Battered junk litters the streets but only a fraction of it's interactive — no smashing crates or kicking cans or punching holes through the sides of abandoned semi-trailers. Sure, that stuff doesn't really matter once the story kicks in, but while you're testing the length of your leash, you'll find it quicker than you might have hoped. The upside? Getting vertical in this game's a breeze. In Grand Theft Auto IV, you tripped with vehicles from point to point. Here you use buildings, and by use, I actually mean "scale," "leap between," and "lunge off of." You don't "enter into," you scurry over, or vault between, from rooftop to girded lattice to crumbling rooftop. Someone at Sucker Punch obviously knows their Assassin's Creed. Per the latter, what goes down must come up...by way of grips, grabs, nooks, crannies, ledges, rails, and other sundry protuberances. Cole — the protagonist — is visually less Altair ibn La-Ahad, more scrawny urban David Beckham, but if you did time exploring Jersualem, Acre, and Damascus in Ubisoft Montreal's stealth opus, digital muscle-memory kicks in and jogs your sense of "been there, can't wait to do that again." Biggest difference? Instead of climbing surfaces mostly at parallel angles, you'll follow the shape of a given thing, whether straight or crooked, part of a rigid superstructure, or wagging like a power line in the wind. As for weaponry, that's all derivative of you. I mean literally, kid-Electro. Okay, so the part where Cole's electricity-based powers cook guns, not his clothes, and he can't ride in cars (he'll purportedly blow 'em up) but can surf on their hoods no problem-o may be silly-science. At least it's an attempt at an explanation — certainly more than we're used to. Oh yeah, Cole can also lunge off towering structures without fear of pancaking. How that has anything to do with electricity beats me, but it's still pretty cool. You can charge external objects by zapping them repeatedly, which means you'll probably have to at various points as a puzzle tactic. You aim with L1, which slides the camera down just over your left or right shoulder and pops a circular crosshairs onscreen. R1 fires quick blasts that won't deplete your underlying power store, while X emits more powerful vortices of energy that do. You can recharge at power boxes and light poles (and pretty much anything with a battery or that's electrically powered) distributed around the city. Fighting's hard to gauge just yet because most of it's locked away here. 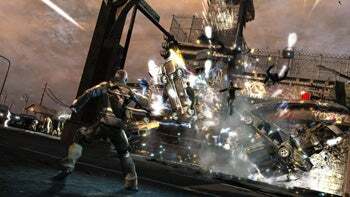 You can chain melee attacks (punch-punch-kick kinda stuff) with a crackling electrical flourish, issue quick zaps, or send bad guys flying with more powerful blasts. There's also a vertical component: Jump from a certain height and you can pound out electric shock waves when you land, damaging enemies, but also innocents if you're being incautious. 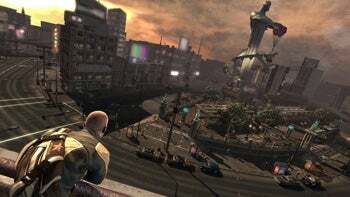 The "powers" selection menu lists 17 abilities, each with three levels, the topmost determined according to your moral character ("hero" verses "infamous"). Speaking of, the demo ends with a "karma moment." More than just a thumb-tap "yes" or "no" to a dialogue box query, but limited to just one of two choices, karma moments are how you shift your alignment between "hero" and "infamous," which determines how people react to you, what powers you're able to unlock, and in a nod to Lionhead's Fable series, your physical appearance as the game progresses. Stay tuned for my full review when the embargo lifts middle of next week. The game ships to stores Tuesday, May 26. For more gaming news and opinion, park your tweet-readers at twitter.com/game_on .